McAlister’s Deli, a leading fast casual restaurant, announces its first location in Omaha. The restaurant will kick off a week of Grand Opening festivities on Monday, Dec. 9. beginning at 10 a.m. with a ribbon cutting ceremony with The Greater Omaha Chamber. “We are very excited to introduce Omaha to McAlister’s great food and genuine hospitality,” said McAlister’s Deli owner George Pendleton. “McAlister’s offers a wide array of menu items from sandwiches and salads to our giant spuds and our famous tea. We look forward to celebrating our grand opening and encourage guests to come and join in the fun.” Pendleton currently owns two McAlister’s locations in Colorado and plans to open five additional restaurants in the Omaha area over the next three years. Tuesday, Dec. 10 – Kids eat free all day. Receive up to two free kids meals with purchase of an adult entrée. Wednesday, Dec. 11 – Wounded Warriors Family Support Fundraiser. 10% of the day’s proceeds will go to benefit Wounded Warriors Family Support, a nonprofit organization dedicated to the families of those who have been injured or killed in combat. *Offers valid only at McAlister’s Deli at 12405 West Center Road. The McAlister’s in Omaha will serve guests daily from Sunday – Thursday, 10:30 a.m. to 9 p.m. and Friday and Saturday, 10:30 a.m. to 10 p.m. For more information, please call the restaurant at (402) 614-3354. Technomic recognized McAlister’s as the 2012 top chain in the fast casual industry for food and beverage and as one of consumers’ Top 5 Favorite Chains in the country. 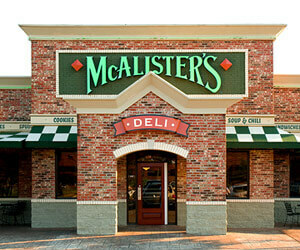 Technomic also ranked McAlister’s third overall on consumers’ visit satisfaction in the third quarter of 2013. Fast Casual ranked the brand No. 2 on its Top 100 “Movers and Shakers” list of 2013 and Paci was named one of the “Top 20 People” in the industry to watch. Founded in 1989, McAlister’s is a fast casual restaurant chain known for its sandwiches, spuds, soups, salads, desserts and McAlister’s Famous Sweet Tea™. In addition to dine-in and take-out service, McAlister’s also offers catering with a selection of sandwich trays, box lunches, desserts, a hot spud bar and more. With numerous industry accolades, McAlister’s has more than 320 restaurants in 24 states. The company has corporate offices in both Ridgeland, Miss., and Alpharetta, Ga. For more information, visit www.mcalistersdeli.com <http://www.mcalistersdeli.com/> . When America goes to war, our families go to war. Wounded Warriors Family Support is an independent nonprofit organization whose mission is to provide support to the families of those who have been wounded, injured or killed during combat operations. Rated a three-star nonprofit by Charity Navigator, Wounded Warriors Family Support aids veterans and their families in healing the wounds that medicine cannot. The group has already provided services for 874 families in 2013 alone.